Discussion in 'One Piece News Central' started by NieR, Apr 4, 2018. 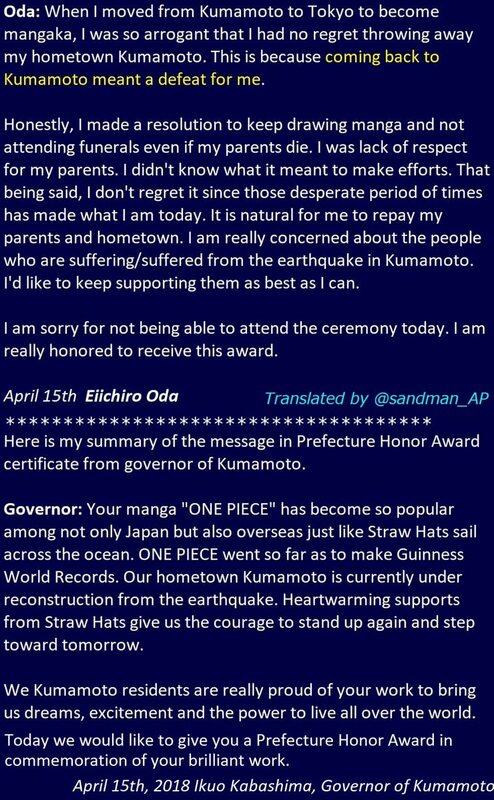 The Kumamoto Prefectural Government announced on Wednesday that it will present One Piece manga creator Eiichiro Oda with a People's Honour Award in a ceremony on April 15. 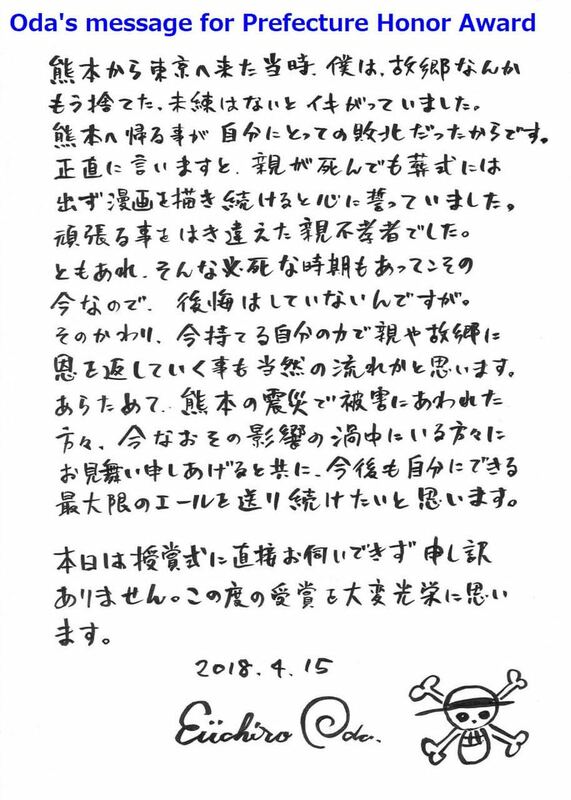 Eiichiro Oda was born in Kumamoto on January 1, 1975, and he continues to support the area to this day. He designed boxes for the area's mandarin oranges and worked on local revitalization campaigns with One Piece art, particularly after Kumamoto Prefecture suffered a series of damaging earthquakes in 2016. Valhala90, mario time, RobertoTheOharaSurvivor and 18 others like this. That's great news congratulations Oda-sensei!! Another award goes to Oda Congrats! Hiken_no_Esu, Nico Robin and NieR like this. anyway, Congrats Oda sensei. You deserve it ! Your home and your country proud of you ! EDIT : seems Oda can't go there. NieR and Nico Robin like this. Woohoo congrats Oda!! Such a great award!! RobertoTheOharaSurvivor and Nitwit like this. Well. Congrats to Oda sensei. This award is big news! One piece is more than a manga !! Oda deserves all the praises and love. Congratulation! 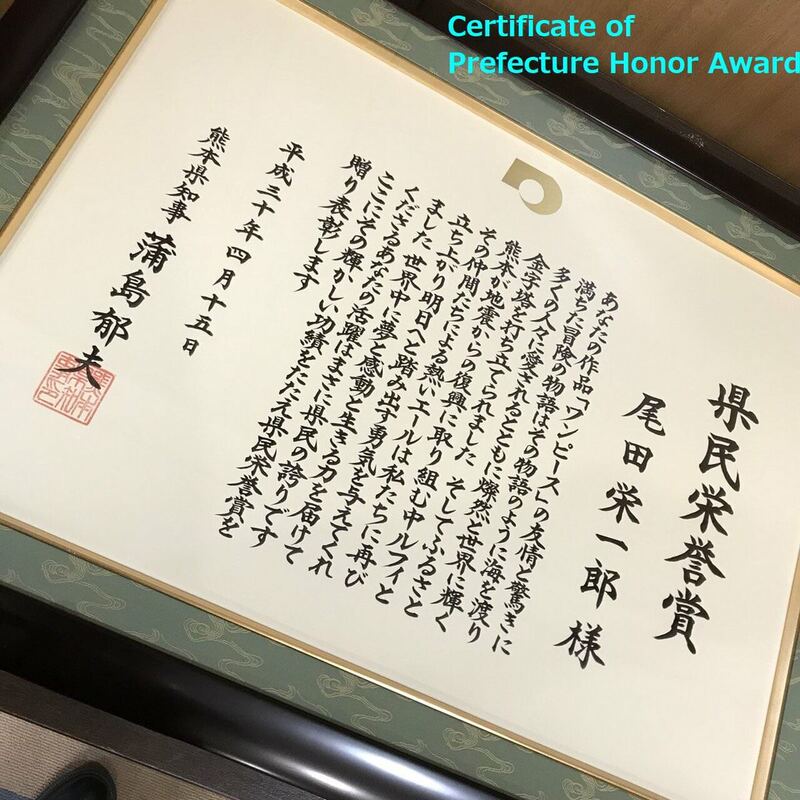 Today Oda was awarded "Prefecture Honor Prize" by Kumamoto, his hometown. It is also announced that they will display Luffy's statue on the prefecture office. Editors in Jump attended the ceremony on behalf of Oda. Oda message translated by sandman !! 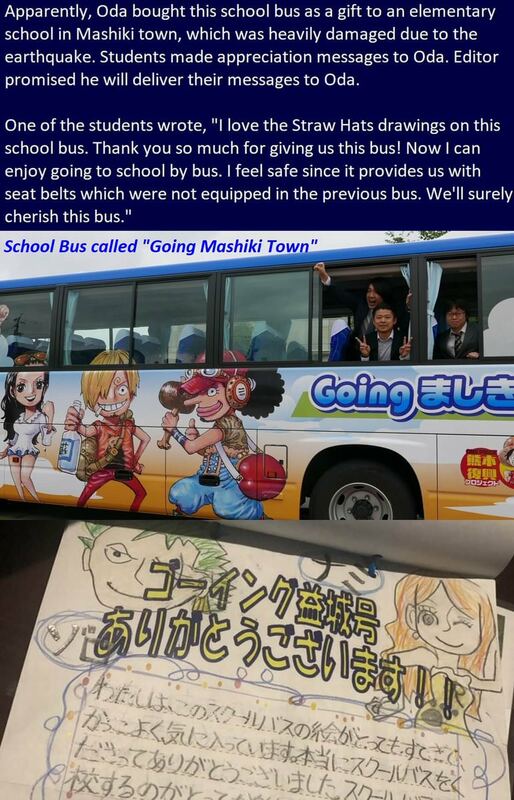 school bus called "Going Mashiki Town"
Nico Robin, Gumshoe, playa4321 and 4 others like this. Imgur links doesn’t work for you?? Nico Robin and Hisoka_05 like this. Wow what an honor. He must feel so freakin proud.